This post is about steps b and c, and all that I’ve learnt about them through the course of the past year while working on a new website (which is yet to be developed) for my client - Design Core India - a multidisciplinary design firm based out of Bengaluru. Founded in 1982 by Suri (Suryaprakash Gowda), the firm specializes in designing exhibitions, retail spaces, civic solutions, museums, packaging, signage systems, and visual communication. Finding the right vocabulary and structure is the unglamorous - behind-the-stage - work of creating content that is vital to its usefulness. This is what the audience doesn’t really notice, or visit the website for, but which directs their experience with the content. Let us take a moment to reflect that this, exactly, is the basis of good design - that it is pretty much invisible. The takeaway, therefore, is to use the user’s vocabulary to organize information. For me, at Design Core India, I am dealing with hard-core design concepts on the business side. But the target audience for their website isn’t designers. It is the CEO of a mining conglomerate, the Director of a pharma chain, or the Marketing Manager of a broadcasting corporation. Get the drift? Clinging on to academic correctness doesn’t work for websites for which the target audience is non-academic. In other words, jargon might be effective for purely B2B products (including websites), but it isn’t for B2C products. Folksonomy is the language of the masses. It consists of everyday (as opposed to academic) terms. It reflects their existing mental models and how they assume the information to be structured. All good content is based on research. However, there were several constraints in this case. First, I had no insights into website traffic since the existing site isn’t linked to Google Analytics. Second, the existing clientele could not be surveyed because of some constraints. Google Trends, combined with some polite social media eavesdropping, proved extremely useful in this context. 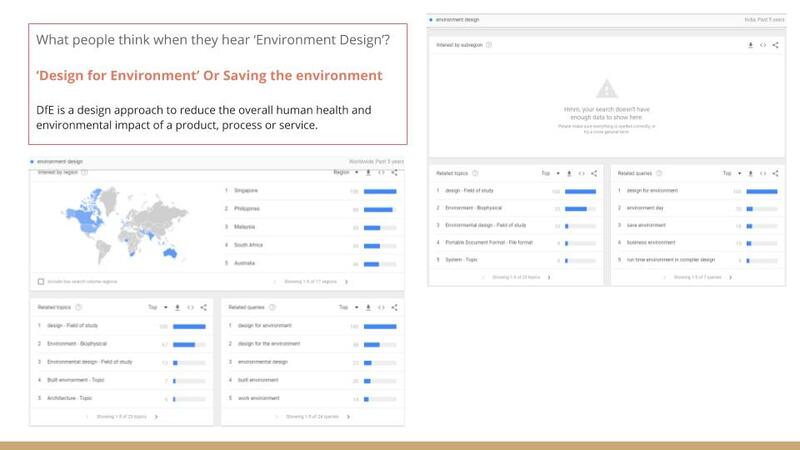 Evidence suggests (see Google Trends charts below) that for individuals such as those mentioned above, a term such as ‘Environmental Design’ is likely to mean solutions for sustainability, instead of human-built environments. Similarly, a term such as ‘Space Design’ alludes to interior design rather than giving shape and purpose to a space. The right approach would be to let individuals such as these, who comprise the audience for your website, lead the way. Identify the solutions that they are seeking within your domain. Identify the words and expressions they are using to describe their challenges. Then use those words, expressions, and mental models of organizing concepts together, to present your offerings. At Design Core India, the evidence suggested that the audience was not looking for solutions in ‘exhibitry’ (existing website) but seeking design solutions for exhibitions, retail, and museums. Similarly, they are not looking for ‘environmental designs’, but are seeking solutions in signage and urban design. And so on so forth. Studying how the target audience communicates reveals the words that they key into Google Search. This is a very exciting stage! After all, as a Content Strategist you are finally on the verge of discovering a common language. Isn’t it? However, you also need to think strategically, giving due consideration to the desired business direction. This is how Content Strategy contributes to business strategy. For instance, ‘urban design’ seemed to be a good contender (on the audience side) for describing ‘environmental design’ (organization side) that Design Core India excels in. However, the core team was very clear that ‘urban design’ had connotations that they did not want to be associated with. Therefore, we settled for ‘civic design’, which while not being the ideal search term being used by the audience, is a close competitor and and is true to the organization’s goals. Similarly, ‘Visual Merchandising’ under ‘Industrial’ category fails to resonate with the target audience. 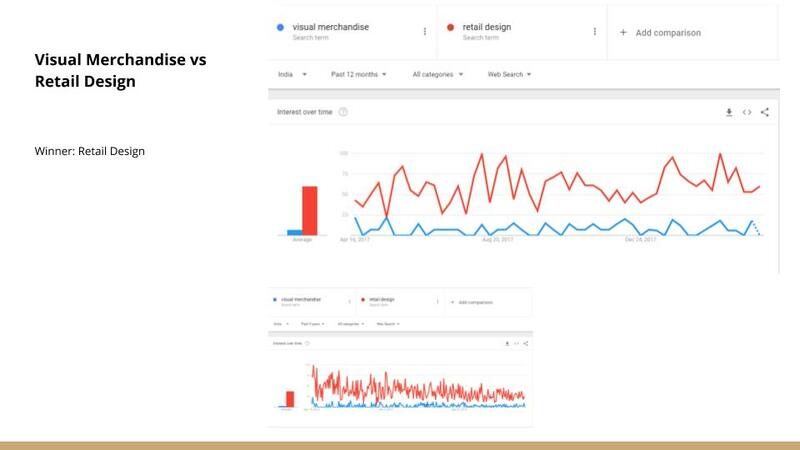 However, the audience describes this offering as ‘retail’, ‘retail solutions’, ‘retail design’, and ‘retail experience’ of which ‘visual merchandising’ is a component. Even strategically, focusing on retail design as an offering made more business sense than underselling their capabilities through just ‘visual merchandising’. It is natural to categorize, to want to club together offerings that come under one category. However, when designing a website, logic and accessibility both matter equally. The basic principle for making any website related decision is to give the audience what it wants - fast. In my client’s existing website, the offerings have been clubbed under categories using a strict academic approach. But does that work for the audience? No. The audience does not care, or does not know, that ‘signage’ is under ‘environmental’, or ‘packaging’ is under ‘industrial’. 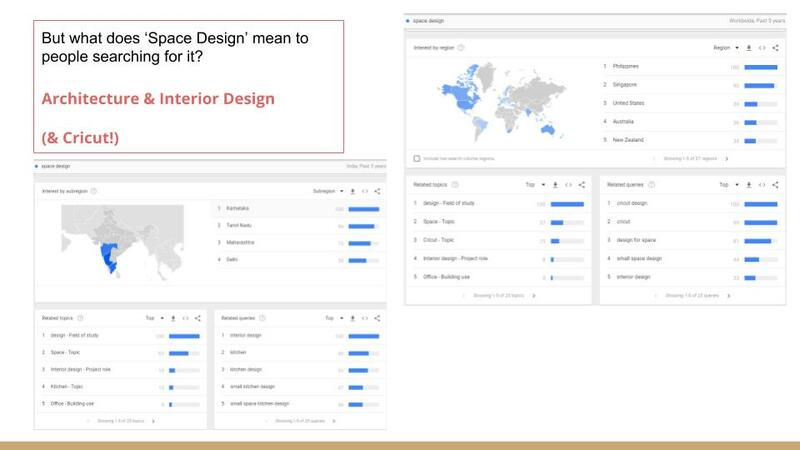 Designers might appreciate this kind of categorization but they are not the target audience for the website.The fact that deeper websites are bad for SEO, does not help the audience either. So, for the new website, the navigation has been simplified to give the audience what they want and what the organization wants to focus on strategically. This is what we are going ahead with as of today. Technically, logo is a part of corporate identity. 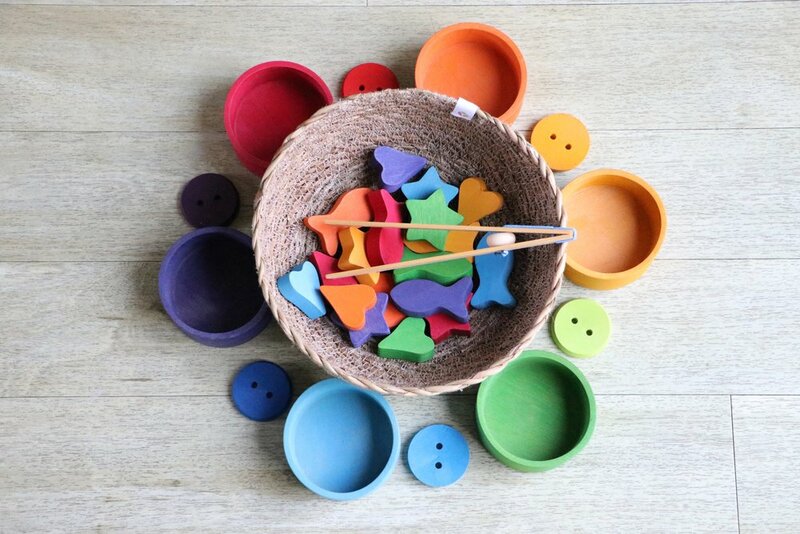 But it has been listed separately because this is one of the offerings within the ambit of Design Core’s work that the target audience is actively seeking out. We decided not to obstruct their search by placing ‘logos’ under ‘corporate identity’, which is not a widely understood term but ranks very high on the kind of work that Design Core does. While ‘The Spirit’ encapsulates the organization’s culture, ‘The Story’ focuses on their journey over almost four decades. Together, they help convey the ‘flavor’ of the organization. 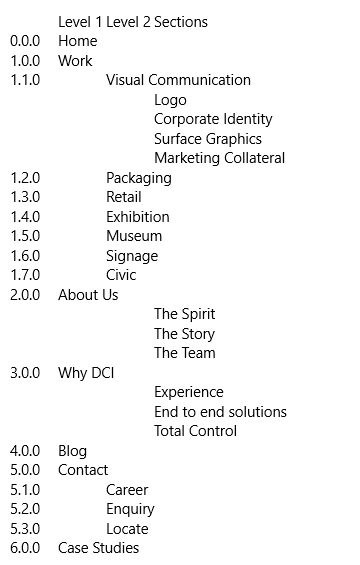 ‘Why DCI’ highlights three competitive differentiators that are easy to understand, require only a few moments to be grasped, and are authentic (as opposed to flowery marketing drivel that populates that majority of the internet). While I haven’t shared all the strategic reasoning behind the website taxonomy, I hope this post explains the approach well enough to solicit feedback. Is it perfect? I don’t know! We will come to know only after the website is launched, feedback is collected from the target audience, and website traffic is tracked over a period of time. That’s when I am going to update this post. However, I am eager to hear from all you content enthusiasts about what you think of this approach. Would like to incorporate your suggestions before we ship off the content to the development team. So, thank you for making it to the end of this post. I am flattered! Now go ahead and share your thoughts below.